Moon and Mercury in the 11th, either in Cancer or Virgo. Moon, Mercury & the 5th lord in the 11th aspected by the 11th lord or joined by the 11th lord. Moon in the 5th in Cancer or Taurus Sign aspected by Venus or Jupiter or both. Mars in the 11th in Aries or Scorpio and is aspected by Jupiter. Mars and Jupiter in the 2nd in Sagittarius or Pisces. Mercury in the 2nd or 10th, in Gemini or Virgo. WE already know that the main significators of speculation are Mercury and the 5th house. Chief significators of the financial transaction are Mercury, Jupiter and Venus. Key star for speculation is Aslesha. Core Bullish Signs for speculation are Aries, Taurus, Leo, Scorpio, Sagittarius, and Capricorn. Main Bearish Rashis for speculation are Gemini, Cancer, Virgo, Libra, Aquarius and Pisces. 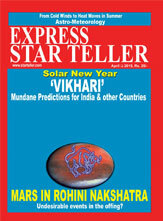 Main Bullish planets are Sun, Mars, Venus, Saturn, Rahu, and Uranus & Pluto. Main Bearish planets are Moon, Mercury, Ketu, Jupiter,and Neptune. 1) Planets' Conjunction in any one Sign. 2) Planets influenced by opposite aspect. 3) Semi Square aspect between Sun and Venus. 4) Saturn's 3rd and the 10th aspect. 5) Mars' 4th and the 8th aspect. 6) Jupiter's 5th and the 9th aspect. 7) Longitude of the Planets. 8) Speed of all the Planets. 9) Retrograde Mercury indicates a lot of fluctuations in the Share Market. 1) Moon and Mercury in the 11th, either in Cancer or Virgo. 2) Moon, Mercury & the 5th lord in the 11th aspected by the 11th lord or joined by the 11th lord. 3) Moon in the 5th in Cancer or Taurus Sign aspected by Venus or Jupiter or both. 4) Moon in Aries, Taurus, Cancer or Capricorn Ascendant in the natal Chart. 5) Moon, Mercury, Jupiter and Venus in the 5th in Taurus, Cancer, Scorpio or Capricorn. 6) Moon in Leo Ascendant and Saturn in 7th. In addition, the Sun & Mars should occupy the 11th in the natal Chart. 7) Moon in Capricorn Ascendant, Jupiter in Cancer, in the 7th and Saturn in the 2nd. 8) Moon & Mars in the 5th. Mercury and Venus should be in Aquarius in the 8th. 9) Moon & Jupiter in the Cancer or Taurus in Ascendant. Saturn & Mars should occupy Libra or Capricorn. 10) Moon and Sun in Cancer or Leo in the Ascendant or the 5th. Moon should not be combust. 11) The Moon and Uranus in the Taurus in the Ascendant or the 5th. The Moon should be at the back of Uranus. 12) The Moon and Jupiter in the Taurus or Cancer in the 11th in the natal Chart. 13) Mars in the 10th in the Capricorn and Jupiter in 9th in the Sagittarius. 14) Mars in the 11th in Aries or Scorpio and is aspected by Jupiter. 15) Mars and Ketu in the 11th in Aries or Scorpio in natal Chart. 16) Mars and Jupiter in the 2nd in Sagittarius or Pisces. 17) Mercury in the 2nd or 10th in Gemini or Virgo. 18) Mercury and Venus in the 2nd in Virgo or Libra or Taurus or Gemini. 19) Mercury in the 11th in Gemini or Virgo, along with the 5th lord, which should be a friendly Planet. 20) Mercury & Jupiter in the 2nd in own or exaltation Sign. 21) Jupiter in the Ascendant, the 4th, 5th & 9th in Aries, Cancer, Leo, Scorpio or Sagittarius. 22) Jupiter in the 4th in Cancer and Saturn in 7th in Libra and Venus in the 8th in Scorpio. 23) Jupiter and Saturn well placed & related to the 5th Lord and the 11th Lord. 24) Jupiter in 4th in Cancer and 8th Lord in 8th. 25) Venus and Saturn in the Ascendant in Libra. 26) Venus in the 9th or the 11th in the Taurus or Pisces. 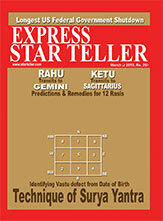 27) Venus in the 5th in own Sign with Rahu. 28) Saturn in the 4th, 7th, 10th or 11th in Libra, Capricorn or Aquarius. 29) Saturn and Rahu in the 11th in Libra. Also known as Tennie C. she was best known as one of the first women to open a Wall Street brokerage firm. Her Stock market gains financed the publication of her fundamental feminist newspaper. At the Stock and Gold exchanges, the news of a brokerage firm operated by a woman was greeted with an emotion of speculation. She died on 18 January 1923, in England,aged seventy-seven. (i) Planetary Conjunction (here, Mercury and Sun) in any one Sign, that is Libra(good memory, utilise opportunity to make money), the 5th house (Stocks). (ii) Planets influenced by opposite aspect. Here 5th house containing, Mercury, Sun and Rahu is being opposed by Jupiter(R) and Ketu. (iii) Semi Square aspect between Sun and Venus. (iv) Saturn's 3rd aspect to 10th house, 7th aspect to 2nd house and the 10th aspect to 5th house (Share). (v) Mars' 4th aspect to 12th house(long term investment) and the 8th aspect to 4th house(handling money). (vi) Jupiter's 5th aspect to 4th (Victory, Fame) and the 9th aspect to 7th (Business). Former American businessman, Stock-broker, Investment Advisor, and Financier. He is the former non-executive chairman of the NASDAQ Stock market. (i) Planetary Conjunction in two houses, 12th (Ketu, Venus and Mars are conjuncted by Orbs) and 11th house (Mercury(R), Moon are conjuncted by Orbs and the Sun). (ii) Planets (Venus, Ketu and Mars) influenced by the opposite aspect of Rahu in the 6th speak of the huge investment he made. (iii) Saturn in the 10th aspecting the 12th house (sacrificing comforts), 4th house (dictate) and 7th house (trade) shows the big business he set for. (iv) Mars with its 4th aspect, aspecting the 3rd house (challenge) and with the 8th aspect, aspecting the 7th house (company). (v) Jupiter (5th aspect), aspects the Ascendant (determination to complete the project) and (9th aspect), the 6th house (striving hard for yield).